If, in 2004, I’d told an MRSA expert that there would be around only 200 MRSA bloodstream infections (BSI) per quarter in England throughout 2014 they’d have laughed out loud. This is because, back in 2004, there were sometimes more than 100 MRSA BSI per month in some London hospitals (and around 2000 per quarter nationally), combined with a general perception that only around 30% of MRSA BSI are preventable. How wrong we were. The reduction of MRSA BSI in England has been dramatic, with a reduction in the region of 90% achieved over a 5 year period. I was asked to speak on “The English MRSA Miracle” at a conference in Portugal today, so thought I’d share my thoughts. You can download my slides here. 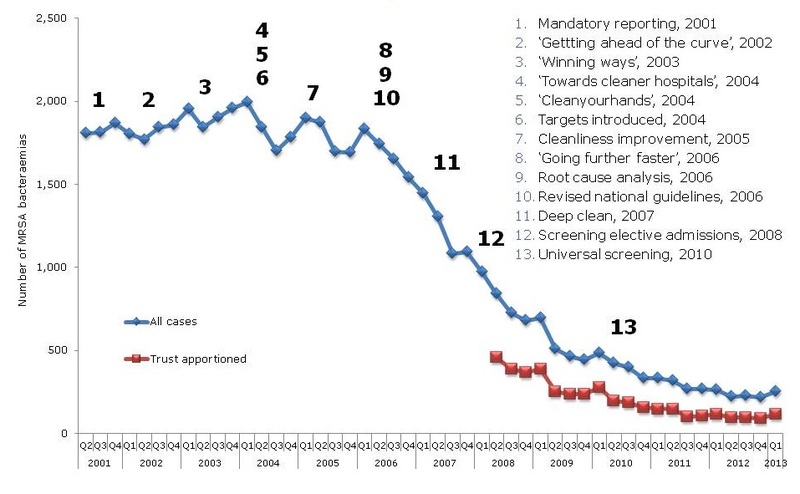 Figure 1: National interventions aimed at reducing MRSA BSI. Some have postulated that the national cleanyourhands campaign is responsible for the dramatic success. Indeed, there is a BMJ study that makes this case, showing that the national significant increase in the use of soap and water and alcohol gel correlated with the reduction in MRSA BSI. However, I contend that this can’t be the case because what has happened to the rate of MSSA and E. coli BSI over the same period? Nothing – no reduction whatsoever. If increases in hand hygiene compliance really do explain the reduction in MRSA BSI, then they should also reduce the rate of MSSA BSI (unless the increase in hand hygiene compliance only occurred after caring for MRSA patients, which seems unlikely). There has been much discussion about whether we should be investing in a universal or targeted approach to infection control. The failure of improved hand hygiene to make any impact on MSSA BSI suggests that targeted interventions are behind the reduction in MRSA. So what targeted interventions were implemented that may have contributed to the decline? MRSA reduction targets were introduced in 2004, a series of ‘high-impact interventions’ focused mainly on good line care in 2006 and revised national guidelines in 2006 (including targeted screening, isolation and decolonization) all contributed to a surge of interested infection control. Infection control teams doubled in size. Infection control training became part of mandatory induction programmes. And hospital chief executives began personally telephoning infection control to check “how many MRSA BSIs” they had left. 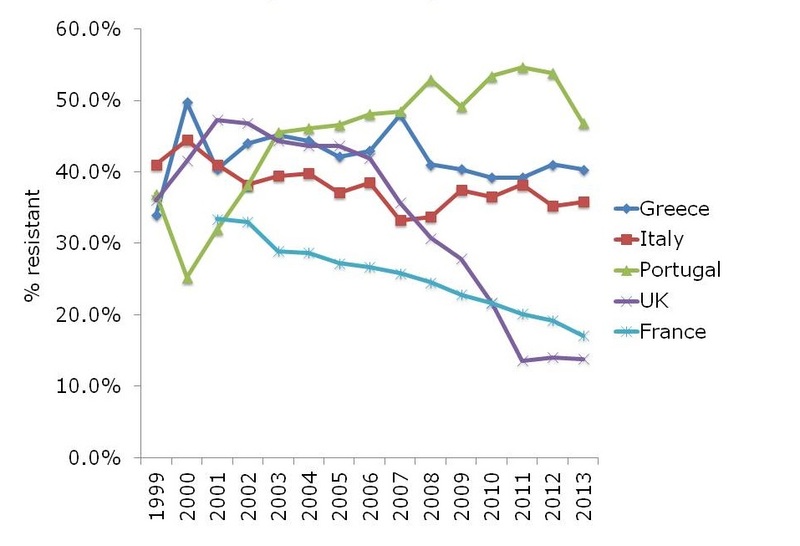 The ‘English MRSA Miracle’ has not been matched in most parts of Europe, except in France, which has had a rather more steady ‘MRSA Miracle’ of its own (Figure 2). Figure 2: Rate of methicillin-resistance in invasive S. aureus infections, from EARS-Net. What is behind the failure of most European countries in controlling MRSA? 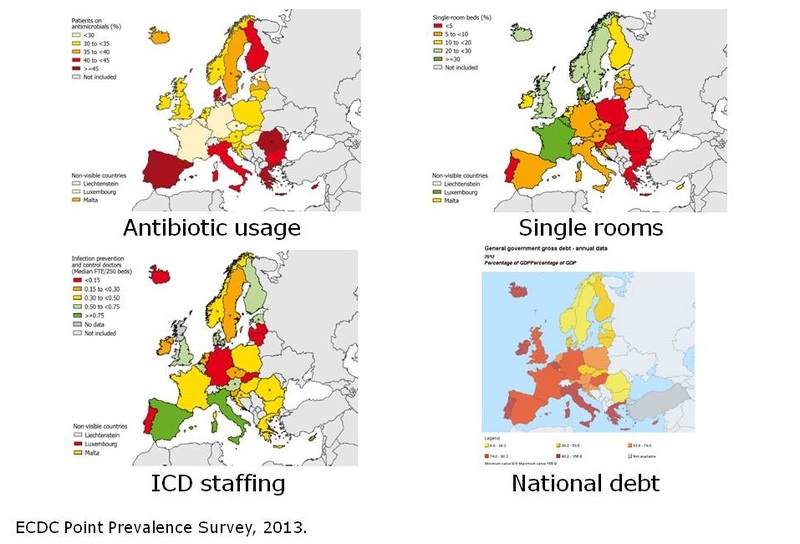 The barriers are multifactorial, but include high levels of antibiotic use, a lack of single rooms for isolating patients, infection control staffing, and, of course, crippling national debt (Figure 3). Figure 3: Barriers to infection prevention and control in Europe. If the English MRSA Miracle is to be replicated across Europe, it will take concerted national initiatives to raise the profile of infection control, combined with considerable investment, which is challenging in these times of austerity. Thanks Barley appreciate you taking the time to comment! You write that hand hygiene should have also had an influence on MSSA bloodstream infections. But I think there might be an explanation why specifically MRSA BSI decrease. When MRSA emerged in British hospitals, the number of infections increased. There was no substitution of MSSA infections with MRSA, it was an “addition” to the burden. Most patients who have an MSSA infection, have it with their own S. aureus, whereas infections with MRSA are mostly in patient that are colonised inside the hospital, with contamination occurring through the HCW’s hands. (MSSA carriage rate in the general population 30-60%, MRSA carriage rate even in high incidence countries even in the general population well below 5%). So with improved hand hygiene and less transmission of MRSA, it could be possible that MRSA infections decrease, whereas MSSA infections remain at a steady rate. Very impressed by the way with the decrease in MRSA BSI. Good work has been done ! My compliments, gives us ammunition against the doctors here in the Netherlands that keep telling me “why waste all that time and effort on prevention of MRSA infections when other countries do nothing about it, in the end we won’t stop it anyway”. Agree – the Dutch “search and destroy” approach should be celebrated, not criticized! As usual a very informative talk/essay. A really great article, Jon! The world has a great deal to learn from your successes! Not my success personally – I’ve had little to do with the reductions in MRSA even in the hospital in London where I work part-time. So, I’m just an interested observer really. Hmmm. Being of a narcissistic bent, I can’t help noticing that Fig 1 shows MRSA BSI rates steady until my retirement in 2006, thereafter beginning a steady decline. It will be interesting to see whether similar rates of decline are achievable in other high incidence countries over the next decade or so. The focus on MRSA and the knowledge that a patient has MRSA may have an impact on practising hand-hygiene – I have seen this, a nurse said to a doctor who was leaving the bedside of a patient with MRSA “hadn’t you better use this?” – pointing to the alcohol rub at the end of the bed. The doctor walked off and ignored them, this was back in March 2004 when engagement was poor and champions of our cause were not as well supported. If the status of a patient is known then it can make a difference if enhanced precautions are in place. In the ideal world HCWs would be diligent with all patients but we know this doesn’t happen as it should. Focusing on a pathogen by screening has undoubtedly played a role, but the emphasis on line care, asepsis, restricting the use of catheters and cannula etc will have played a role too, but why, as you say, has this not impacted MSSA bacteraemia? What is your view on routine decolonisation. A Trust who uses this practice has not only reduced the MRSAb, but all MRSA and MSSAb – they haven’t had an MRSAb for four years in fact. Could this lead to future resistance – the regime used is Hibiscrub and Bactroban? I would also be interested in your view on MSSA outside of the hospital setting. I have seen and been on the receiving end of what I perceive as good and poor IPC with invasive procedures in GP surgeries, this includes wound dressing, venepuncture and immunisation. I had my flu jab this week and thought about previous innoculations and experiences where my arm was inflamed and uncomfortable, so took the extra precaution of using alcohol rub prior to the latest procedure, no inflammation this time – I have looked at the reviews conducted on to cleanse or not to cleanse the skin prior to immunisation and the jury remains out on this question – however when you give blood the transfusion service cleanses the skin for the finger prick test prior to donation, their infection control is pristine throughout – OK this is my finger, possibly higher risk than my arm – not if I’m an MSSA carrier. My GP practice does not cleanse my skin prior to taking blood samples unless I ask them to – poor practice for sure, I know it is low risk but if I am an MSSA carrier, are they potentially introducing this into my bloodstream to sit malevolently until my immune response is not so good, are we making assumptions about this only being a risk if an invasive device is going to left in place? Hand hygiene is very poor at the practice, but if you remind staff they will wash their hands, but don’t do it as a matter of course. Standing back from a patient perspective (not being an expert in IPC) I think we need to take a much tighter stance on primary care and IPC. I’d be interested in your view Jon. Thanks for this post its thought provoking.